You won’t want to miss the SB Open Streets Launch party tonight from 7-9 pm! Please forward this to friends, family and co-workers that you think would be interested and help us build the momentum for this important and exciting initiative where we will close Close Cabrillo Blvd to traffic on Nov 2nd and open it for people powered movement, fitness and arts, dance for all ages and cultures! We are at a very exciting point! 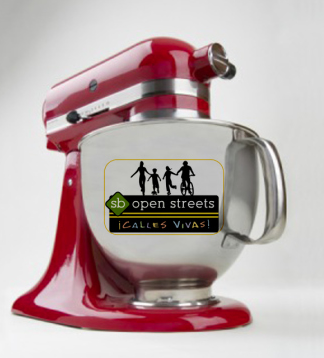 It’s time for an SB Open Streets Kick off Mixer! Join us in building the momentum, creating ideas and the connections that will make SB Open Streets one of the best initiatives in the nation. Please join us in spreading the word to anyone who can help make the event a success. We will close Cabrillo Blvd from the Pier to the Bird Refuge and part of the Funk zone to traffic and open the area for people powered movement, art, fitness and fun. Join us and be part of the exciting team that makes it happen! Come to the mixer and check out videos from other Open Streets Initiatives across the globe and how the Open Streets movement highlights cities efforts to support public health and sustainable transportation and be inspired for what we can do on our waterfront drive. The day after the mixer we will be initiating an Indiegogo Crowdfunding campaign to raise the final needed funds to make Open Streets a success. When this comes out, please help us by forwarding the link to your contacts. Know a Group that would be Interested in Open Streets? Invite them to the mixer or invite the Open Streets Coordinator to come speak to your organization! Really excited? I know you are! Our next Committee meeting will be held at REI on Thursday, August 29th at 6:30 pm – be part of the excitement and help us plan! We need you to make it a success. For those of you I haven’t had the opportunity to meet yet in person, I look forward to connecting with you at the mixer or sometime very soon! Please feel free to call/email me directly with your ideas for programming or opportunities to market the event. Please help us spread the word by spreading this email to all your contacts and keep an eye out for our Open Streets E-newsletter with more info soon! Join us and bring the streets alive on November 2nd for Santa Barbara Open Streets! ← New Map of the Funk Zone!